Boat Ownership- In the end, it's about getting out on our Lakefront! Our city's greatest assett (our skyline) is best viewed from the water. But then again, we might be a bit biased. Enjoy. The NEW Beneteau SENSE line- Market Leadership Redefined. Mr. Mossberger, 31, shares a 2002 Chaparral 280 Signature and goes out on Lake Michigan with his friends nearly every weekend. "The best part about owning a boat like this is that it allows us to stay in touch. As you get older, it's harder to do that," he says. Still, he acknowledges, "there are some challenges." New boaters or die-hards pinched by the economy are the most likely to share ownership of a boat. Once they can afford it, though, most leave the communal life behind quickly. They say goodbye to disagreements about the cost of repairs, whether to add upgrades such as air-conditioning and who they can bring onboard as a guest. Mr. Mossberger, owner of Stretch bar in Wrigleyville, says his group abides by written rules "to make sure it's not awkward. It's all on paper. There's no gray area." Owners must text everyone when they want to use the boat. Any of the co-owners can join the person initiating the trip. The boat leaves at about 2 p.m. You can bring any number of girls but only one guy. When issues arise, they turn to the contract. "We don't get mad," Mr. Mossberger says. You can't, says Lou Sandoval, owner of Karma Yacht Sales in Chicago, or you may as well end the partnership. "I tell people to have a down-to-earth conversation about how the boat will be used and who will use it more, and you have to have a sunset on the agreement that allows you to exit gracefully," Mr. Sandoval says. A legal document should allow co-owners to revisit their partnership at a certain time, allowing a chance to continue or buy a partner out. Now on his fourth partnership, he says such agreements made his previous splits amicable when co-owners wanted out after having children. "You see (partnerships) go wrong when they aren't aligned in the goals of the use of the boat. One guy wants to spend a lot on high-tech equipment to re-outfit the boat and the other owner might say, 'What's with the bells and whistles? Can't we use last year's sails?' " Mr. Sandoval says. Bob Zeman, 71, founder of Chicago-based Norwood Paper Inc., is in the sixth year of what was supposed to be a two-year partnership with Gene McCarthy, 82. They disagree often, about how frequently to race the boat or when to buy new sails: "If we were all exactly like one another, it would be dull," Mr. McCarthy says. But the two men respect each other's sailing and this week will embark on the Race to Mackinac with their 69-foot sailboat. They have not made the partnership legal: "I come from an era where a handshake and a word are good enough," Mr. Zeman says. Dirk Lohan, a co-founder of Lohan Anderson architects in Chicago, equates boating partnerships with marriage. "Two people come together, and they have different personalities and different priorities," says Mr. Lohan, 70, now the sole owner of a 55-foot custom-designed boat. A few decades ago, he shared ownership of a smaller boat. "I'm a cleaning freak, and I saw things that should have been done that weren't done. Food was left in the pots and was mildewing," he says. "I pointed it out, and it got solved amicably, but I decided if I can, I'm going to own my boat free and clear by myself — which has its own shortcomings, because you have more work to do." But partnerships still exert a pull. 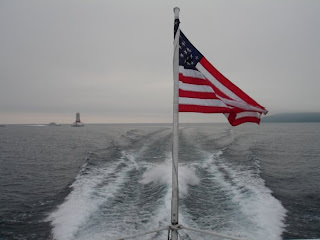 It makes sense to share the costs and labor, given the time and money involved for a short boating season. Len Goodman, a criminal defense attorney, was ready to sell his 19-foot motorboat when friend Martin Herman, a neurosurgeon at Advocate Lutheran General Hospital in Park Ridge, talked him into keeping it, proposing a partnership in which Dr. Herman takes care of the maintenance and storage. Also next-door neighbors in Lincoln Park, they say they're both easygoing and neither demands frequent use of the boat. "We don't clash. I really only like to water-ski, and the weather has to be perfect for that, which isn't very often," Mr. Goodman says. He had just returned from one of those perfect mornings, despite having arrived at the boat to find no life jackets left aboard. "We had to use those flotation devices; I'm sure we were violating some sort of safety rule," he says. "You can't let things like that bother you." The biggest challenge to their co-ownership came a few years ago when Dr. Herman married and had children, making it more difficult to coordinate use of the boat, Mr. Goodman says. He credits having a small boat (19 feet) with keeping disagreements to a minimum, with lower costs and no large parties onboard. That's the very reason Michael Wolf, 41, has two boats: a 34-footer of his own, which he sails out of Monroe Harbor, and a 9-foot dinghy that his family shares with another in Evanston, to introduce their combined five kids to the water. Mr. Wolf, a partner at Jenner & Block LLP, says the low cost — the dinghy was $3,000 — makes the situation less fraught. "It's our first season together, but we've known the family for a while," Mr. Wolf says. "If any concerns pop up, it will be about maintenance or upkeep. Those are simpler to solve for a small boat. For a big boat, that's where you get into trouble; I couldn't imagine doing that unless you had complete alignment." There are three kinds of boating partnerships in Chicago's nine harbors. Sociable co-owners boat together. Like Mr. Mossberger and his pals, they tend to be younger, single and able to head out to the water at a moment's notice. You're just as likely to find them hanging out in Diversey Harbor with a case of beer as on the water. There are the co-owners at the Chicago Yacht Club at Monroe Harbor who sail together during regatta season. And there are those who share ownership but seldom see each other, boating for leisure with their own close friends and family. These relationships are most ripe for tension, as co-owners are less bonded to each other. For Gene Mackin, the challenge of shared ownership was figuring out the value of labor vs. money. "Some of us had money, and some had time. The people who had the money thought they had a greater stake, but some put in a lot of time. How do you value five hours at the boat yard vs. $250?" says Mr. Mackin, 71. He owned his first boat with four partners; "Holiday" was a 40-footer with a 12-foot beam and 6-foot draft, bought for $15,000. But that was four or five boats ago, back in the 1960s. — Boat owner Gene MackinToday, he outsources the labor on his boat to Bob Remsing's SailTime Chicago, part of a worldwide network of fractional boat ownerships. The local office operates in Burnham and Winthrop harbors, overseeing upkeep and storage and offering an online scheduling system. Mr. Remsing says a good number of his clients came from boating partnerships gone bad. "There's always someone who wants it cleaner," he says. There are disagreements about handling the boat on the water, getting the boat ready for the season and repairing it. Not to mention scheduling. "What if you both want to take it out to watch the fireworks for the Fourth of July?" Mr. Remsing says. Willie Wagner, 47, the owner of Honky Tonk BBQ in Chicago's Pilsen neighborhood, has owned his 44-foot boat with a number of partners over the past 20 years. Right now, there are four. He's seen tempers flare over cleanliness ("It's a bunch of guys, so it's always been a little bit of a frat house," he says); contributing to spring upkeep ("If you have someone who is like, 'All I do is drive the boat,' that's a problem") and money. "What if one guy can't come up with the money by Feb. 15, when payments are due at the harbors? Then the other three have to make it up by a certain date," he says. "That's been the biggest beef." He's not sure he could handle it without a lifetime of preparation. "If you're going to be a partner in a boat, you shouldn't be an only child; you have to know how to share," he says. "I'm one of 11 kids." 2 FIRST TOGETHER from Team First 30 on Vimeo. Video Footage of the Team First 30 Trials in France. Fast Seahorses! Amidst the hot weather of July, we spent a recent night with New Owners Jason and Les Veatch talking sailing with WGN-TV's Marcus Leshock. Jason has been a crew member aboard a First 36.7 -Karma for the past four seasons. It has been a pleasure seeing him develop as a sailor and taking on new positions on the boat. This past off season he decided to launch head on into boat ownership and buy his own boat which he has christened 'Veni Vidi Veatchy' a play on the famous declaration by Julius Ceasar in the war at Pontus in ~47B.C and his last name. 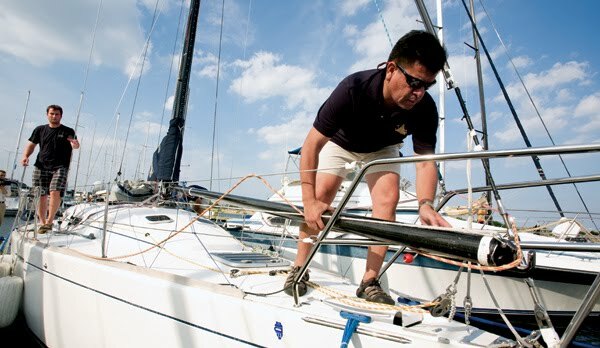 He has also taken on the nautical life in full force by joining the Chicago Yacht Club as an Associate member. It represents a new phase of Jason's life as he becomes a boat owner at the age of 25 and teaches the sport to his father Les. We are sure there will be many quality memories aboard their new Beneteau and are glad to be a part of it. Jason will be doing his first Race to Mackinac in two weeks so you can be sure he will have many stories to tell when he gets back. This past Tuesday, he officially christened his boat compliments of Veuve Clicquot Champagne- Presenting sponsors of the 102nd Chicaco Yacht Club Race to Mackinac at the docks of Chicago Yacht Club. Congratulations Jason and Les- Fair winds from your friends at Karma Yacht Sales. With the Thermometer consistently in the 90 degree range with just as much humidity, one can't help but to think of the cool waters just off our lakefront. The enclosed article breaks some commonly held myths about what a drowning victim acts like. 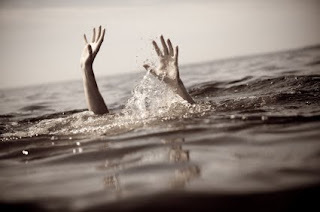 It can happen to everyone especially since the cool inviting waters of Lake Michigan can mean overexertion that could lead to cramping or just plain getting in to waters too deep for our swimming abilities. For those of us that are parents- the concern is double. Hopefully, you'll pick up something from this piece- I know we all did. Drowning doesn't look like Drowning..
•Ladder climb, rarely out of the water. Wishing You a SAFE and Happy Fourth of July Holiday! To say that this weekend is one of the busiest on Chicago's waterfront is a huge understatement. As many of us may know, The City of Chicago's Fireworks have been scheduled for July 4th at three different locations (see below). This is a departure and a bit of an adjustment for those that have grown accustomed to the July 3rd megafestival that occurs simultaneously with the Taste of Chicago brings thousands upon thousands of people down to experience one of our City's best assetts our lakefront. It also positions the marine community in the middle of an increased amount of boat traffic and many of the issues that come along with that. So as your Lake Michigan Sailboat Dealer for Beneteau- we'd like to remind everyone to be safe out on the lake this weekend. Mind your rules of the waterway and practice safe boating. Be mindful of others and don't take risky chances you might regret. Most of all - have fun with your friends and family celebrating our great Nation's Birthday. North Side lakefront (with prime viewing from Foster to Montrose). South Side lakefront (with prime viewing from 63rd Street to Promontory Point). WGN-TV (Channel 9) will show the festivities during a one-hour special, “Chicago’s Summer Blast,” beginning at 8:30 p.m.